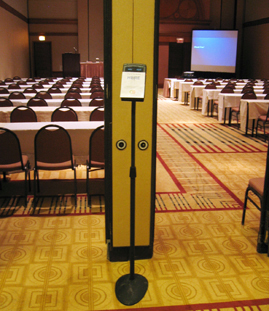 The SmartTouch is ideally suited for In/Out tracking of attendees at seminars, conventions or other temporary placements. A built-in memory and clock allows it to independently read, timestamp and log every attendee that places their badge to the unit. The transaction is clearly and automatically indicated as in or out each time with color coded lights. The units can be configured to track attendee activity as scanning In Only, In/Out or Out Only for a variety of event needs. SmartTouch units are wall or stand mounted units that can easily be moved from one location to another or be placed in different locations within the educational session or exhibition area. All scans are stamped with date, time, location and then stored in memory. These transactions are downloaded in real-time to determine the duration, times and locations for each participating attendee. During the event, Convention Communications will automatically download the data from the deployed SmartTouch units and output processed data to Excel file formats, and produce client ready reports in Excel and PDF file formats. Standard event data reports include summaries and graphs showing number of attendees scanned, peak attendance, average time on floor, and attendance change over time. Convention Communications also has the ability to transmit all compiled attendance data to other contractors as needed.